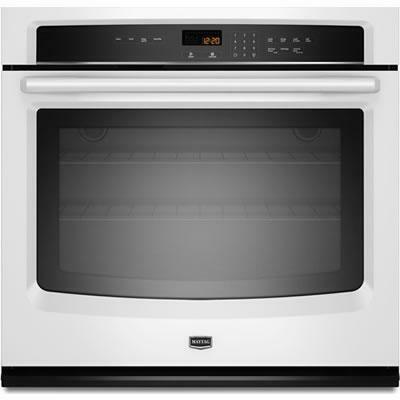 Maytag 30" electric wall oven with a 5.0 cu.ft. capacity and Precision Cooking™ system. The innovative FIT system ensures your beautiful oven will install in your existing opening without any cutting or extra wood trim. A panoramic view window offers a large and stylishly simple way to monitor food, while heavy-duty racks make it easy to hold large items. Additional Information FIT System Offering Streamlined Installation; Precision Cooking™ system with Precise Preheat; Precise Bake and Precise Broil; Variable broil; Panoramic View Oven Window; Self-Cleaning Oven with Adjustable Cleaning Levels; Hidden Bake Element; Undercounter Installation; Features : Audible Signal, Automatic Door Latch, Cancel/Off, Clock, Control Lock, Cook Time, Delay Start, Favorites, Keep Warm Setting, Precise Bake, Sabbath Mode, Timer, Warm Hold. Additional Dimensions Oven Interior Height : 18"; Oven Interior Width : 25"; Oven Interior Depth : 19; Cutout Depth : 24"; Cutout Height : 28"; Cutout Width : 28 1/2". Warranty Limited 1 Year Parts and Labor; Second through tenth year limited warranty (Certain component parts only-labor not included).